Delicate and precious at the same time; with the simple design, the new Little Secrets bracelets from THOMAS SABO convey the deeper significance of wearing jewellery. Each bracelet is intended to symbolize the wishes of the wearer and thus becomes a very special, daily accessory. From the 20th April, the THOMAS SABO world will be extended to include these elegant pieces of jewellery. “It is mostly the small things in life that touch us. 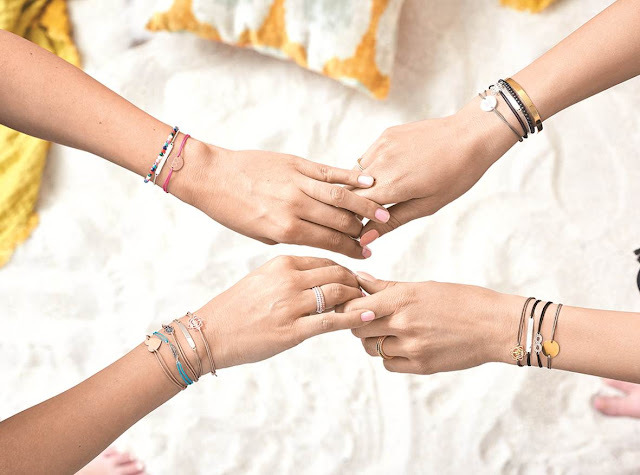 Our Little Secrets bracelets symbolise and cherish our deepest wishes. One or several designs in combination create a highly personal look”, says designer Thomas Sabo about the inspiration. Popular motifs from the THOMAS SABO collections, such as the anchor, tree of life, feather, infinity symbol or lotus flower are part of the series. There are also coins, hearts and bars, which can be personalised with a free engraving, with more than 60 symbols as well as letters and numbers to choose from. The fine, hand-knotted textile bracelet is also adjustable in size. Aaawww~~ I'm in love ^^ those accessories really simple BUT lovely. OMO The bracelet looks like a must have! So in trend! looks special and great! will add them into my collection!